An estimated 20 million Americans have thyroid disease, making it a common frustration for many. One of the most startling facts about thyroid disease is that as many as 60% of all sufferers don’t even know they have it. If you have symptoms like gaining weight easily, always-cold hands, or chronic constipation, you may have thyroid disease. At Wellness 1st Integrative Medical Center in Gilbert, Arizona, the natural-minded health care physicians have the expertise and skill needed to diagnose and treat your thyroid disease in an innovative way. Book your appointment through the online scheduler or by phone today. *Please Be Advised: The following materials presented on this site are for educational purposes only. This information is not intended for diagnosis or any other purposes. How does the thyroid gland affect my health? Your thyroid gland essentially manages your metabolism — it's like a gas pedal for your body. The hormones produced by your thyroid directly impact nearly all of your organs. Your T3 hormone is crucial for cellular function. Your body converts about 80% of your other thyroid hormone, T4, into T3. However, sometimes your body is not able to do this conversion successfully, and that leads to too-little T3 and many frustrating symptoms. Many hypothyroidism sufferers have multiple symptoms, or even most of these symptoms at some point. Hyperthyroidism symptoms are generally the opposite of hypothyroidism symptoms. Hyperthyroidism sufferers often have several or possibly all of these symptoms at one time. What is the treatment for a thyroid imbalance? If you have unbalanced thyroid hormones, bringing your T3 and T4 levels into balance is usually the first concern. Your Wellness 1st Integrative Medical Center doctor begins with a series of precise tests to determine the degree of your hormonal imbalance. This may include blood, saliva, and stool tests. You correct your hormone levels through recommended adjustments. Your doctor does a full nutritional analysis, which includes looking for connected issues like gluten intolerance, allergies, and vitamin deficiencies. Once you know your connected issues, you can make specific dietary changes to correct thyroid hormone issues. In some cases, you may also need special supplements, including an all-natural thyroid hormone replacement, to help you balance your thyroid hormones properly. Wellness 1st takes the whole-body approach to your wellness, meaning you’ll enjoy relief not only from thyroid problems but also from other problems plaguing your body. 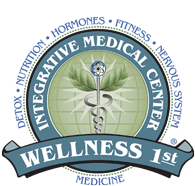 Schedule your consultation at Wellness 1st Integrative Medical Center through the online tool or by phone now.